When it comes to time, two minutes seems like nothing, especially when you're watching your favorite television program, playing a game or doing something else you really enjoy. All it takes to brush your teeth is two minutes, twice a day. Yet, somehow, those two minutes seem like forever. How important are those two minutes? Simply swiping your toothbrush quickly over the surface of your teeth and calling it good is not nearly enough time to properly clean your teeth. And leaving behind plaque, bacteria and food particles promotes bacterial growth, and puts you at a higher risk for gum disease and tooth decay. In two minutes, only 120 seconds, you can much more effectively clean all surfaces of your teeth. • Buy a toothpaste with the ADA seal. • Use only a small amount of toothpaste. In this case, more does not mean better. • Hold the toothbrush at a 45-degree angle to your gums. • Brush all surfaces of your mouth, fronts of teeth, backsides, chewing surfaces. Don't forget your tongue, too! 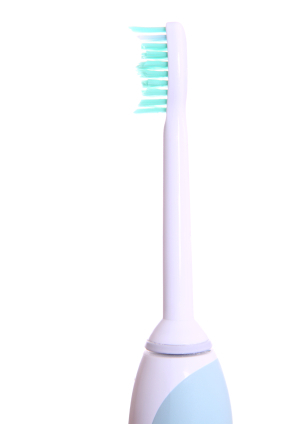 An electric toothbrush vibrates and moves the bristles, essentially doing all of the hard work for you. All you need to do is guide the toothbrush across all surfaces of your teeth. There are several models of electric toothbrush that have timers built in, so you'll be sure to reach your two minutes every time. Can You Brush Too Much? While dentists recommend brushing twice a day, it is not a problem to brush more. It is, however, a problem to brush too hard. Don't be fooled into thinking that if you brush harder, you don't have to brush as long. If you brush too hard, you can wear your gums and the enamel of your teeth, leading to gum recession, tooth sensitivity, and an increased risk of developing tooth decay. Those two minutes twice a day can make or break your fight against serious oral health issues, such as tooth decay and gum disease. For more information about how to properly brush your teeth, contact our office today.